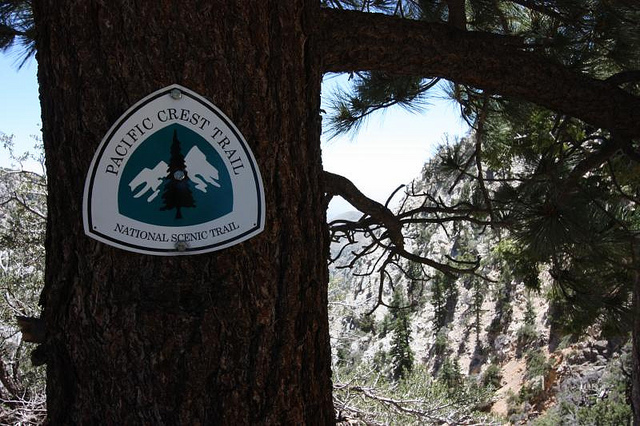 The Pacific Crest Trail is here… what other trails will you explore? We’re getting ready for the many outdoor events coming soon to Big Bear Lake. The lake is buzzing with activity as our friends and neighbors are getting ready for some spring and summer outdoor recreation. Nature is preparing too. The weather is getting warmer, the days are getting longer, and the flowers are peeking out in the woods. This is a great time for hikers and runners to take advantage of all the trails that wind their way through the area. It is warm enough to be comfortable out there any time of the day and help you break a nice sweat if you are working out. The views are gorgeous too. It looks like that spring weather is going to cooperate with us to make the next week perfect for those outdoor activities. Here’s what to do if you’re coming up. You do not need expensive equipment to enjoy all of the beauty in the Big Bear area. All you need is a sturdy pair of shoes and a few hours. The hiking trails will do the rest for you. The Pacific Crest Trail is one of the most popular and familiar trails in the Valley, running from Washington to the Mexican border. Big Bear Lake is along its path. The Pacific Crest Trail is very well-marked and offers quite a few changes in terrain as you explore it. The Woodland Trail is a relatively short and flat 1.5 mile hike, perfect for beginning hikers. After you have a little bit of experience on the trails, you can tackle the Cougar Crest Trail, a nearly six mile trip that starts just west of the Big Bear Discovery Center, and is a gentle upward slope to the Pacific Crest Trail. If you walk another half mile, you can make it to Bertha Peak for a breathtaking view of the surrounding area. It might not be the easiest hike, but if you want to get to the highest point in Big Bear, the Sugarloaf National Recreation Trail is for you. The ten mile trail starts off a dirt road, rising to the highest point in the valley at an altitude of 9,952 feet. There are plenty of other hiking paths to explore nearby too. Whichever hiking trail you choose to explore in Big Bear Lake, make sure you brought the right equipment for the day, depending on the length and difficulty of the trail selected. When you get back to the lake, come back to your room at Big Bear Frontier and relax for a little while before exploring the Village or heading to your favorite restaurant. And if you took any amazing pictures you want to share with us while you are out, let us know through our Facebook page. We look forward to seeing you soon! Gallery | This entry was posted in What to see and do and tagged Adventure, Bertha Peak, Big Bear CA, big bear lake, big bear mountain, big bear valley, bird watching, birding, Cougar Crest Trail, exercise, family, fun, hiking, mountains, nature trails, pacific crest trail, spring, Sugarloaf National Recreation Trail, The Woodland Trail, trails, travel, vacation, weather, What to Do. Bookmark the permalink.